The paper submission portal is now closed. The final submission deadline of 22 February has passed. If you wish to submit a paper for post-deadline poster presentation, please CLICK HERE for more information. Post-deadline papers need to be submitted by June 25, 2019. The default ratio for projectors at M&M 2019 is 16:9 (high definition). Please plan your slides accordingly. A 4:3 ratio will work; however, there will be black vertical bars on either side of your projected image. If you wish to preview your presentation, a Speaker Ready Room will be available in the Oregon Convention Center. Poster Presentations are scheduled for Monday, Tuesday, Wednesday & Thursday, August 4-8, Exhibit Hall BCD, Oregon Convention Center. All regular poster presentation notifications will be sent on or before May 2, 2019. Papers will be assigned by the Program Committee to either a Platform or Poster presentation, unless "Prefer Poster" is selected in the online paper submission site. Authors will be notified of their assignment by May 2, 2019. Poster assignments will specify a presentation day; however, all posters are required to be displayed for the duration of the meeting. All posters shall be displayed Monday morning through Thursday 12:00 Noon. 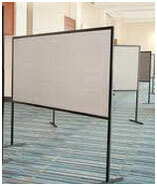 Each poster will be allocated an 18" deep x 72" wide table, placed directly below the board. This table may be used for a laptop or other supporting media or display. NO POWER WILL BE SUPPLIED - any supporting media must be able to run on battery power for up to two hours. The published proceedings for the M&M meeting are 2-page scientific papers (required of all contributors), which are reviewed by at least two members of the Program Committee for content, format, and appropriateness. These can be referenced in your subsequent publications, and are published by Cambridge Core as a supplement to the journal Microscopy and Microanalysis. This is in marked contrast to other meetings that distribute ABSTRACTS (usually only to attendees), and these abstracts are typically not available as references for future work. Key scientific "firsts" are routinely reported in the M&M Proceedings, whereby priority can be documented. We highlight new and innovative developments, as well as informational and tutorial content. You will be able to find electronic copies of our papers online using the standard publisher DOI referencing system, and requests are routinely made for copies of our short papers. Our Proceedings, a compendium of meaningful reports, with full access, is not typical of other meetings. This adds to the popularity of the M&M annual meetings. For use in future publications or presentations, MSA releases a free copyright for publication of content (including images) that were used in the meeting's Proceedings. The Proceedings papers are published on digital media, online on the Microscopy and Microanalysis (Cambridge Core) homepage as Supplement 3 to the Journal, and as a hardbound Print-on-Demand option. Most Proceedings papers are on the Web of Science. Medline usually does not reference the Proceedings papers.